You can buy the standard sunken ship or plastic undersea plants at any pet shop, but if you want to give your fish tank a unique look, it's better to shop for decorations around your own home. 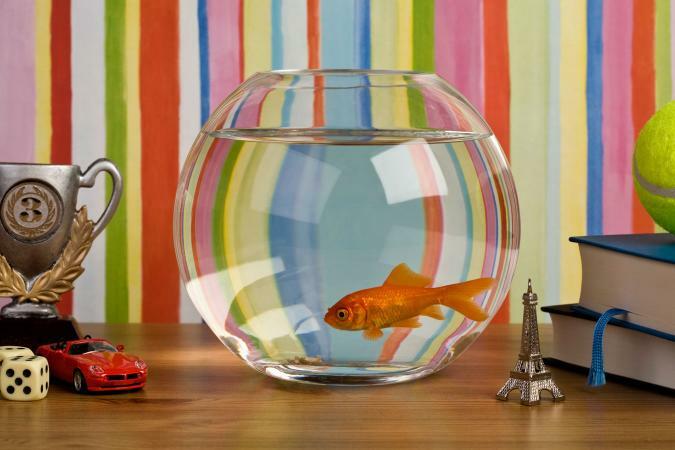 There are tons of great fish tank decorations using everyday items, from your kids' toys to the stuff in your china cabinet. Try some of these awesome options. Love that insanely awesome model of the Death Star? What about that replica of Hogwarts Castle that took you weeks to complete? Legos can be perfect aquarium decorations, as long as you have the space. Use Lego animals and bricks to make a zoo for the fish to enjoy. 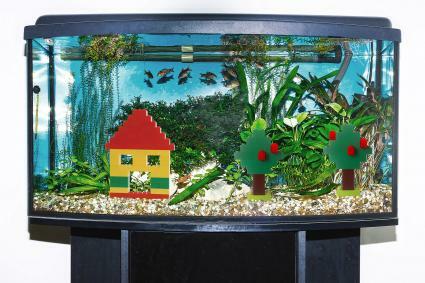 Create a literal home for your fish by building a house and filling it with Lego furniture and appliances. Pick your favorite superhero or movie and use Lego sets with that theme to recreate the setting for a fictional, undersea world. Make some Lego construction vehicles and set up Lego people to work on the construction inside the tank. Lego has stringent safety standards about the plastics they use in their toy bricks, making them a good choice for putting in a fish tank. Avoid using glue with the blocks, as this can contaminate your fish's water. Also, be sure to thoroughly clean your Lego creations before using them and every time you clean out the tank. 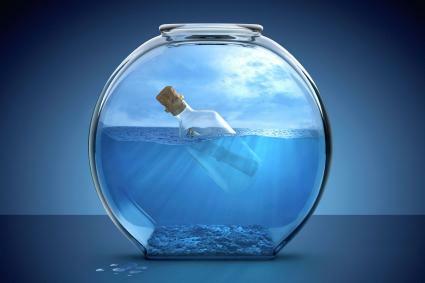 There's nothing quite as mysterious and interesting as a message in a bottle. You can add a floating bottle to your fish tank with a few things you have around the house. This idea will work in almost any size of tank. Choose an antique bottle or other ornate, interesting looking example to give the whole decoration a really old world feel. Consider a colored glass bottle for a pop of red, green, or bright blue. For a fun gift, write a love note or special message on a piece of paper and put it in the bottle so the note shows through the glass. Glass is safe for fish; it's the material most tanks are made of, after all. However, you should avoid plastic bottles, as they aren't always designed with the highest safety standards. Also avoid natural corks, since the cork can become water-logged and create a breeding place for germs. If you have some pretty china you never use, why not set up a tea party inside the tank? You can use your favorite pattern or just something you inherited from Grandma. Either way, it's an adorable, totally unexpected choice for aquarium decor. Put a lace table cloth under the tank to create the fancy feeling from the outside. Tip one teacup on its side as if it has gradually settled to the ocean floor from a luxurious passenger ship. Place a whole teapot inside the tank, making sure there's plenty of room for the fish to swim in and out of it. 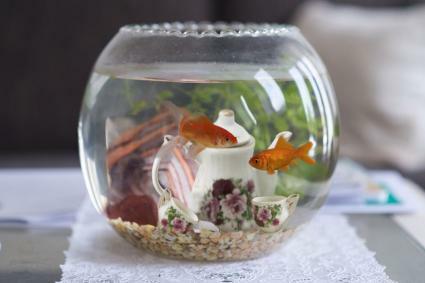 Use a child's tea set for a miniature version of the tea party, making sure you have enough settings for each of your fish friends, of course. Fishkeeping World notes you should only use food-safe ceramics in your fish tank. Since your china cabinet is full of food-safe dishes, you should have plenty of options. However, it's also a good idea to avoid delicate finishes that might flake off, such as gold or silver leaf on the edges of cups or saucers. You've been to a big aquarium and viewed the huge sharks and fish through the glass; now you can create a tiny version of that experience with your tank at home. If you have a train set, you can use model railroading figures to set up scenes of visitors watching your fish from outside the glass. Model railroading figures come in all different sizes, from super tiny T or Z scale to larger HO scale. You can use whatever scale you have around the house if you're into model railroading. 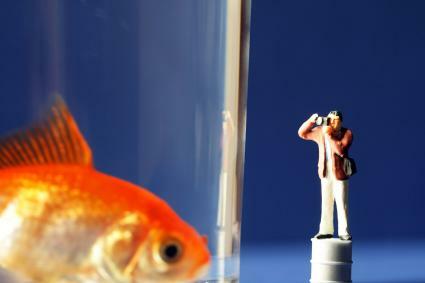 Choose figures who are doing things people would do on an aquarium visit, such as taking photographs. Set up whole beach scenes with sunbathers and people getting ready to go fishing. Arrange figures at different heights using blocks or bricks, so they are more visible to people admiring your awesome fish tank. It's important to avoid putting painted plastics in the tank, according to Fishkeeping World. Be sure to keep your figures as a decoration on the outside. The holidays are a great time to get creative with the decorations of your tank, especially if you have some extra holiday decor. You can do this for any holiday, from Halloween to Easter to Christmas. Pick some plain, colored glass ornaments and remove the hanging hardware. Fill the ornaments with water and place them on the bottom of the tank. If you have food safe holiday figurines, like Easter bunny-shaped salt and pepper shakers, put those in the tank. Add holiday lights around the outside of the tank to bring even more cheer. Avoid anything painted or sharp, even if it makes a cute holiday decoration. Similarly, consumable items are a bad idea. Remember, you can always use those items on the outside of the tank! 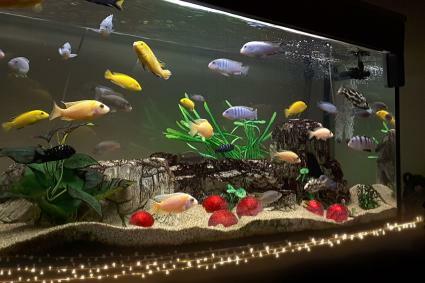 Creatively decorating your aquarium doesn't have to break the bank. Look around your house to discover some unique decor items your fish will love to explore.